It isn't everyday that you get to experience history being made. 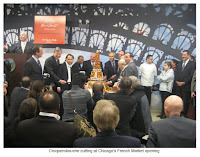 I can't help but think that the opening of Chicagos French Market (131 N. Clinton St.) in our fair city's growing West Loop neighborhood was an historic event. 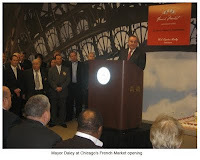 A who's who of Chicago and Paris was in attendance, including the Parisian owners, the Bensidoun family, the vice mayor of Naby le Sec (France) Jean-Paul LeFevre, Mayor Richard M. Daley, Aldermen Brendan Reilly (42nd Ward) and Walter Burnett Jr. (27th Ward), all kinds of politicos, and Robert Wislow, Chairman and CEO and Camille Julmy, vice chairman of U.S. Equities (the developer) and a plethora of other executives from the company. Every Chicago television station was represented and hordes of media as well as Chicago V.I.P. dignitaries were there. A personal note of thanks for the Bensidoun family for extending an invitation to both Lee and I. Here's why you'll want to run, not walk, there ASAP! One-stop shopping! Whether you're picking up dinner, lunch, breakfast, a snack, food for the office or home, or holiday gifts, you'll be able to find the freshest locally grown, artisan-made produce, meats, fish and seafood, breads, chocolates, and patisseries under one roof, 12-months a year, six days a week (closed on Sundays). Much of the produce is organically certified. 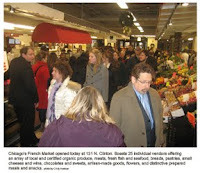 The Chicago French Market is our first year round market, boasting 15,000 sq. ft. of European-inspired shops. 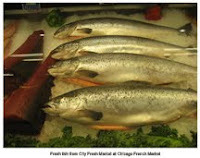 It's an exciting destination for locals and anyone traveling to Chicago for business or pleasure. We are so excited about this for many reasons. Our office at Kurman Communications is two blocks from the French Market. We plan to shop there often. We suggest that you do, too. The re-development of the West Loop has been happening for years but this block seemed to miss out, until now. Clearly, it's a destination with which to be reckoned. It will serve as the anchor for the MetraMarket, conveniently located just north of the Ogilvie Transportation Center, the new hub of Chicago's West Loop. Lucky us and Chicago commuters, Espression by Lavazza Italian cafe finds its newest home here. Kurman handled the introduction of Espression with their first location in the Drake Hotel. This key location is a welcome addition, with their fabulous coffee creations, grab-and-go, and gelato. 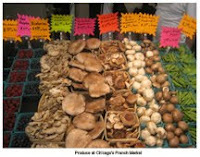 World travelers will recognize the French Market as its owners, the Bensidoun family of Paris, operate 95 open-air and indoor markets throughout the U.S. and France, including 13 seasonal markets in the Chicago area and one of the largest certified organic markets in Europe. We've always been a big fan of markets: Green City Market, Seattle's Pikes Place, New York's Grand Central Market and San Francisco's Ferry Building have been among our favorites for years. 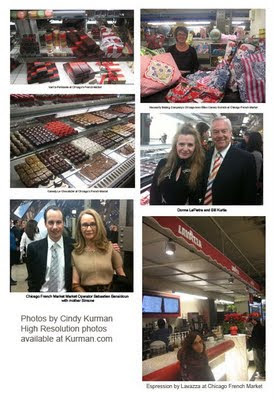 We know that Chicago's French Market will play a starring role on our destination list and look forward to showing off our neighborhood to everyone that's willing to let us brag. Thanks Chicago's French Market. We look forward to being one of your soon to be many glowing fans.